Does a ship replaced beam by beam remain the same vessel? Does a broom with 17 new heads and 14 new handles remain the same broom? Does a refabricated sculpture remain an original? Never Mind once looked like a hull. So it is apt that Richard Deacon’s long running artwork be used to illustrate Theseus’s paradox, also now known as the paradox of Trigger’s broom. In 1993 it must have been a thing of joy: pristine wood skilfully curved into the shape of a dirigible. The laminate finish reflected the surrounding trees and the sky into which it might have floated. Now it looks more Roswell rumour than classical bark. This tells us a little about the digital age which was only just beginning in ’93. Never Mind was put back together like a jet engine. Stainlesss steel has been used for a full-scale replacement forged from notes and measurements. The legs are so polished that the Middelheim landmark really does now appear to float. It still looks like it could travel; the unmanned voyage should be good for another 24 years. Will any of us be here in 24 years? Who cares, asks Never Mind. Just marvel at this precise workmanship. Legally, at least, it is the same sculpture. Restored and recoated, say Middelheim Museum. A work in progress the catalogue and the app both seem to imply with the dates 1993-2017. The art lies in the outline, the gradients, and the precise dimensions rather than the materials. If an object is a displacement and not a thing, that’s one response to the paradox above. Never Mind can be seen at Middelheim Museum, Antwerp. 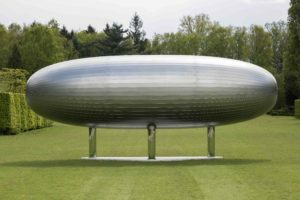 Until 24 September it forms part of the Richard Deacon retrospective Some Time.